In Sri Lanka where there are many Meditation Centres Pallekelle Devanapethis Samatha Vipassana Meditation Centre is a Meditation Centre of the Theravada tradition of Buddhismis very much different from others. Its founder the Late Venerable Amatha Gavesi wanted a Meditation Centre where the Strict methods of Meditation in terms of the Buddha’s discourses are followed. He was a meditation instructor at the Kanduboda Buddhist Meditation Centre, but he left that Centre as he disagreed with the choice of the up and down movement of the abdomen as an object of Meditation by the Centre, as it is out side the teachings of the Buddha. The Buddha had recommended , and he himself used the in and out breath as the object of meditation. After leaving Kanduboda, he went to the Daham Medura, Embuldeniya, Nugegoda where he started conducting 14 day retreats on a unique method developed on his own keeping strictly within the teachings of the Lord Buddha. He had a firm belief that women are spiritually more caring and the Buddha Sasana will continue its existence through the piety and devotion of the Buddhist Women. Therefore, he sought the assistance of these lay women Upasikavo in white robes. In 1996 he invited Chandra Manio from Pothuhera, Kurunegala, who was an ordained yellow robed Sil Matha to head the Order of Nuns, he intended to establish later. 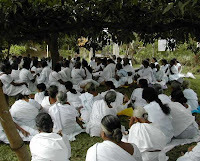 The contribution of Venerable Amatha Gavesi to the Buddhist Meditation in Sri Lanka is unique, as he initiated the establishment of the Order of Dasa Sil Manio- lay women, who had given up their homes to live a monastic life keeping ten precepts, and uplifting their status among the Buddhist laity, giving them the responsibility of teaching the method of Meditation he founded based on his own personal experience. His objective was to give the true Dhamma, with instructions for meditation to the poor villagers from remotes parts of the Country. 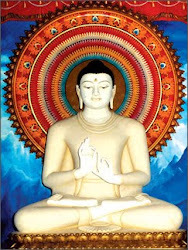 He reduced the complexities of the teachings, and made meditation accessible to the devout villagers who are satisfied making generous donation of alms to the Buddhist monks,to acquire wholesome kamma (kusala kamma) but apprehensive to take to meditation. He was very successful in his endeavour and the villagers from remote areas of Sri Lanka came to the Centre for Meditation, and now they have become the main providers of alms to the Priests , the Nuns and the Lay meditators of the Centre. This allows the Meditation Centre to give free meals and accommodation for any one who comes for meditation. The Meditation in the Centre is based on the teaching of Loving Kindness, extended to all living beings, and contemplating on the loathsomeness of the 32 parts of the body. The Venerable Amatha Gavesi Thero the founder of the Centre who was Born in Walana, Panadura on the 19 December, 1918 passed away on the 11 June, 2003. 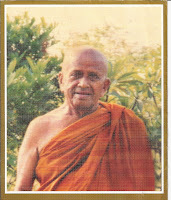 He was succeeded by Venerable Mahawatte Panditha Pemalankara Thero, who also died in 2009. The Centre is now managed by the Venerable Chandra Loku Maniyo. Chandra Loku Manio is the very embodiment of the dhamma practiced at the Centre. She remains to-day the guardian of the principles laid down by her teacher the Late Venerable Amatha Gavesi Mahathera to keep the practice of Meditation strictly within the teachings of the Buddha. 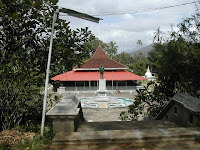 Pallekelle Devanapathis Samatha Vipassana Bhavana Centre is situated in Pallekelle, Near Kundasale. 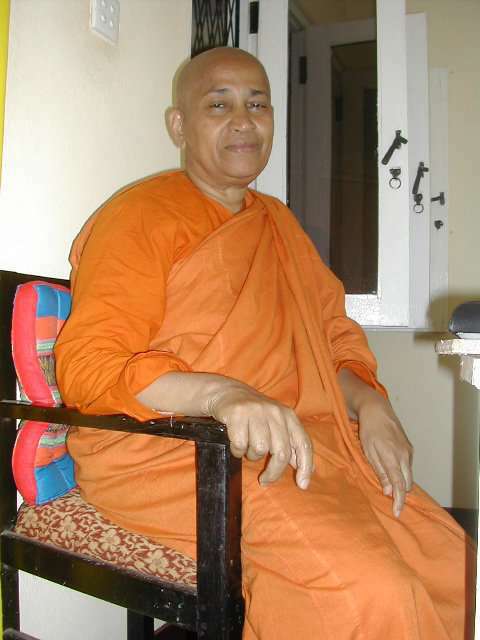 The Venerable Amata Gavesi was ordained a Monk at the Kanduboda Meditation Centre, where he was a meditation Instructor. Later when he left Knaduboda Meditation Centre and was looking for a place to start a Meditation Centre of his own, the present land and the buildings from the Pallekelle Gam Udawa project of the late President R.Premadasa were presented to him in 1991. 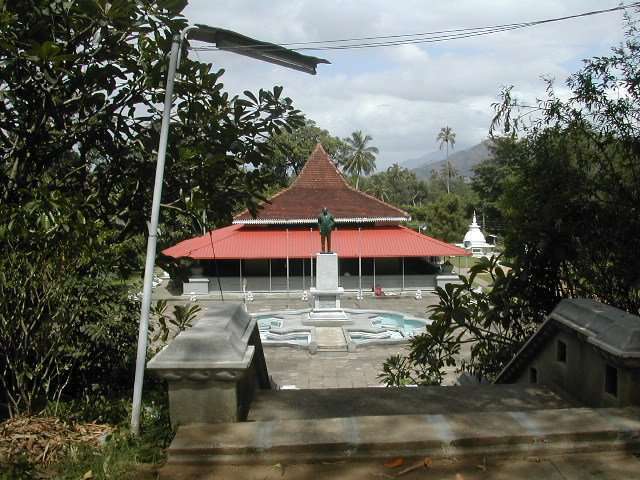 Later many benefactors came forward from Sri Lanka and Singapore to help construct additional buildings, providing separate “ kuti” or rooms for woman and men meditators, Shrine Rooms, a kitchen and a dining hall. The Centre is self contained with its own electricity power plant, water pipes, and buildings. It has about 30 resident nuns. There is accommodation for about 50 meditators. The meals are provided by the donors, who have previously registered their names. They come to the Centre the evening before to prepare the breakfast and then the Lunch. No meals are served after that other than offering plain tea at four and seven in the evening. In addition to alms giving by the laity, there are also those who make financial donations to help the maintenance of the Centre. A lay meditator is not required to pay for accommodation or meals, these are provided free. 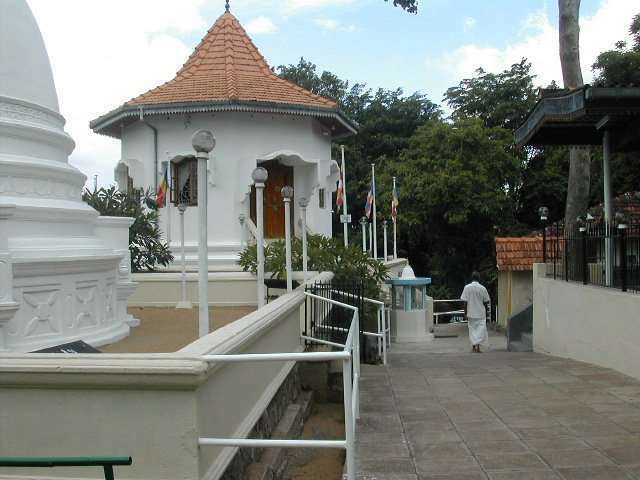 The Meditation Centre is situated a good distance away from Kandy. One who has to go to the Centre should take a bus from the Kandy Bus Stand at the Clock tower to Pallekelle or take any bus that goes to Digana or Kundasale and ask to be dropped at Pallekelle Gamudawa Meditation Centre. The Method of Meditation at the Devanapathis Samatha Vippassa Meditation Center is the practice of Kayanupassana (meditation on the 32 parts of the body) and Metta Bhavana (meditation on Universal love to all beings, directed to the 10 cardinal points). The former, against attachment to self and the latter ,against aversion. This is followed by the meditation on the in and out breath as it touches a spot under the nostrils (anapanasati bhavana) to attain Samadhi ( deep concentration) and allow the mind to absorb into four jhana states through noble effort with determination. Mindful observation of nama (mentality) and rupa( materiality) and hetu (cause) and phala (effect) and the attention turned towards rising and falling away of thoughts conditions the mind for Vipassana Meditation. Thereafter careful practice of Kammatthana( instructions) given by the nuns(Manio) a meditator may ascend the path in stages to attain freedom-nibbana. Zen Buddhism speaks of a Buddha citta the original mind, that every being possessed before it became cluttered through continuous belief in a self and developing various habits in the process of cultivating the self. Bringing this mind back to its original purity is the development of the mind without distortion. Other Activities of the Nuns at the Centre. 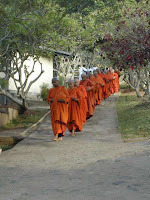 The Nuns- Manio as they are called, not only dispense the Buddha Dhamma related to Meditation to those who attend the regular 14 day retreats at the Centre, but also visit the Open Prison at Kundasale where they conduct Meditation Sessions for the benefit of the Prisoners. They also give sermons-Dhamma desana and conduct meditation classes in the temples near by and in Kandy High School, Pushpadana Girls School and Mahamaya Collage in Kandy. It would be a great experience for the expatriate Sri Lankans or foreign tourists to Sri Lanka to pay a visit to this Centre when ever visiting Sri Lanka. What is Different in the Pallekelle Meditation Centre and how is a day spent as a meditator ? Before I went to the Bhavana Centre at Pallekelle I had written about in my website. I was meditating at Nilambe Bhavana Centre, which was in charge of my friend late Godwin Samararatne. I did several retreats there but the atmosphere in the centre was not to my liking. It was predominantly a Meditation for the Western Meditators. My friend who was then conducting meditation was more often invited to conduct meditation retreats abroad and the centre when he was away was Managed by the Western meditators, who had been residing their for a long time and developed a sort of vested interest in the Centre. They had their own ideas of conducting meditation retreats which were not what I had expected it to be. However, I followed a meditation retreat there conducted by an American Buddhist monk Yogavacara Venerable Rahula, which was interesting and gave me an added interest in the practice of meditation. When I was meditating there at Nilambe Meditation Centre I met some people who spoke to me of the Meditation Centre at Pallekelle, and invited me to visit that Centre. I went their with my brother and met the High Priest Venerable Amatha Gavesi, who was the founder of the Centre. He was a very kind person and he invited us to follow the next 15 day meditation retreat . We accepted the invitation and that was how I began my meditation practice in that Centre. Each retreat that begins after the full moon day of the month lasts 14 days. The day at the Centre begins at 4 in the morning. All the meditators, about thirty selected from those who have been registered on individual requests, get together at the main hall at 4.45 in the morning. The Instructions are given by Nuns who had been trained to give meditation instructions. These Nuns conduct the morning offering of flowers, light lamps before the Buddha Statue in the shrine room in the Hall . Then every one sits down to join in prayers, chanting of verses, and few Suttas. At the end every one is offered a cup of potage of rice and milk, mixed with medicinal herb, before they meet again in the Hall to follow a conducted meditation in loving kindness (metta) and then contemplation of the 32 parts of the body. Then all the meditators sweep and clean the premises. They are then invited for the morning alms giving (breakfast). After that the meditators divided into groups of 4 or 5, go to the Nuns allocated to a group to take meditation instructions. You are treated as a new comer to meditation even if you have practiced meditation before. The meditators are required to follow the instructions given by the Teacher in the Centre. After taking instructions the meditators may go to any quiet place in the Centre, or in the garden under a tree or under a pillar in the Hall and meditate on the in and out breath( anapanasati bhavana) and do walking meditation in between, which cuts the monotony of the sitting meditation and helps develop concentration , until it is time for lunch. After lunch the meditator may take a small break before continuing to meditate. In the evening every one is served with a plain cup of tea and no food what so ever is allowed after lunch . A meditator may continue to meditate late into the night. The following day after the breakfast the meditators meet their respective teachers and give a complete report of the previous days meditation experience, their personal problems, difficulties in following the meditation instructions, and any matter concerning meditation, and personal problems met with in the course of meditation. That is how a day is spent in the Meditation Centre. Having gone through this wonderfully created website giving such in depth information had been an enormous valuable kusala kamma. I am in quest of following a proper meditaion and teachings of Buddha, and at this moment my only access is the internet, and my own practice and investigations and yonisomanasikara. My heartfelt gratitude for this site and looking forward to make a trip to Sri-Lanka soon and attending a retreat. I forgot to mention that I live in the U.K.
May the blessings of Triple Gem be upon You!! Thank you Priya Aram. I have just posted a translation of a Dhamma talk by the late Meditation Teacher Ven; Amatagavesi of the Meditatiuon Centre. I have still to complete it, but as it is an interesting talk I posted what I have already translated. I hope you would one day go to this centre for two weeks. I am sure you will not regret it. Feel free invite Ajahn to your Vipassana meditation center. I appreciate the time and effort you have given to explain everything here. Also, I would like to add a few thoughts on your article. From what I have seen so far, the Mahasi method of meditation has been useful and beneficial to many people, including Sri Lankans and foreigners. At a glance it may seem that this method is not taken directly from the Buddha's discourses, but this is not the case. There's a misconception that being mindful of the rising and falling of the abdomen is a type of Anapanasati(Mindfulness of the Breath), but in fact, the Mahasi system doesn't describe this as Mindfulness of the Breath, rather, as a Mindfulness practice on the qualities of the Air Element, or Vayo Dhathu. So this is actually a Dathu-manasikara practice than an Anapanasathi practice. The progression of this practice on the movement of the air element is similar to the meditation progression of the other elements. Anapanasathi, as you know, the Buddha didn't teach to be a practice focused on the Vayo Dhathu, but a practice that covers all Four Foundations of Mindfulness. So it seems this is where the confusion arises, mistaking the Dhathu-manasikara practice recommended in the Mahasi system to Classical Anapasathi. It is simply a practice where we train our minds to see the Three Marks of Existence in the present phenomena by concentrating our minds on the qualities of the the Air Element, rising and falling. Thank you for your service to the Sasana.